For anyone who's ever wandered around the Hamptons (it is open to the public), it is full of beautiful and interesting landscape and scenery. Local poet, author and photographer Rob E. Smith (of Longfellow Road) has compiled a book on the area called Patchwork. 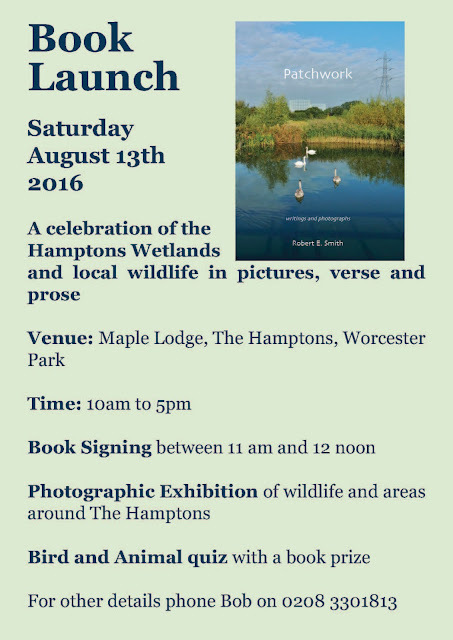 The book is a celebration in poetry, prose and pictures of the Hamptons Wetlands and other local wildlife sanctuaries. There is a book launch and signing today (Saturday 13th August) at Maple Lodge in the Hamtons between 10am and 5pm. There is also an exhibition of wildlife photographs from the Wetlands, a bird and animal quiz with prizes and, of course, the book signing. Everybody is welcome to pop in. Get in before midday to get your copy signed.